I’ve learned a few things recently and all are to do with smells. 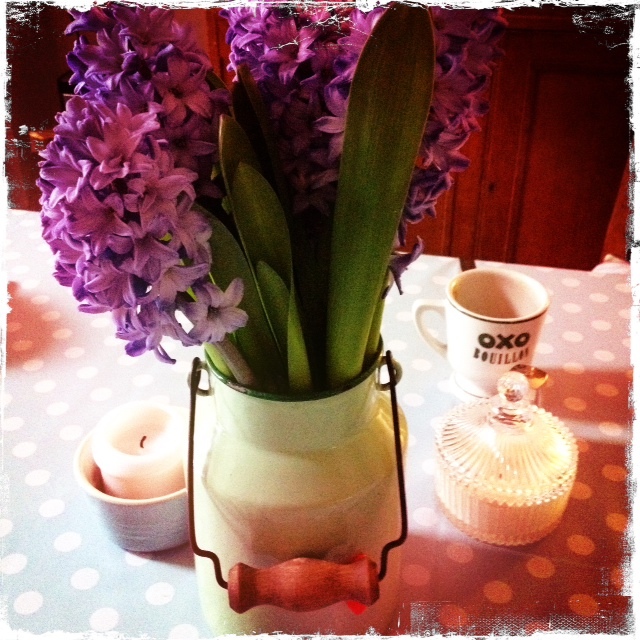 The first is that scented hyacinths make me enormously happy. They not only look wonderful but smell delicious. They’re coming to the end of their blooming so aren’t very easy to find but if you do spot them, buy them, they’re worth every penny. Put them in a pot where you can’t see the stalks, they’re not very pretty, it’s all about the flowers and the leaves. The other smelly thing I’ve learned is the joy brought by lavender oil when used in washing. I’d often been told about adding a few drops to the softener compartment in the washing machine but never really believed it would do anything clever but it does. I never use bought softeners as I have two children with crazy sensitive skin which reacts at the merest hint of perfume. So, I thought natural lavender oil was worth a go, especially since it’s apparently very good for keeping moths and other mites at bay. I used it for the first time yesterday when washing the kids bedding and it emerged with the most wonderful subtle scent which I’m hoping will aid a good nights sleep as well as making me feel very homely indeed. My oil is from Celia Lindsell who uses French Organic Lavender in all her products. You can buy it online too. And that, you’ll be pleased to know, is the end of my housewife post. Phew.